· Ernie has been awarded an Order of Australia, three AFIs. In 1994 he was named NAIDOC Aboriginal of the Year. · Ernie is also a patron of the West Australian Youth On Health Festival, or YOHFest. This is a State-wide drama, dance and art festival that requires high school students to write, choreograph and perform their own play or dance based on a health issue. Ernie has been volunteering to the festival since 1998. · Voted National Aborigine of the Year in 1994 and a National Living Treasure in 1997. · In 2004, Ernie was nominated at the Logies for most popular TV presenter for ‘The Great Outdoors (1992)’ and got a Silver Logies award. · After a stellar career in film and television that began in 1978, Ernie is become one of Australia's most recognisable and liked screen personalities. 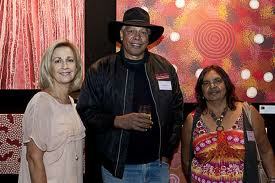 · In 1997, Ernie was named one of Australia's National Living Treasures and he was also Aborigine of the Year in 1994. · Ernie Dingo was awarded 'the man' in 1997. Ernie hosted the 2004 Deadlys awards and won one of his own, which was winning the Deadly for Outstanding Achievement in Film and Television. · Ernie was selected for the state basketball team in 1973. · Ernie has always been very involved in traditional Aboriginal dancing. He joined the Middar Aboriginal Dance Theatre in 1978 and made his first trip overseas on the company's tour of Germany, which he says "was a real eye-opener". · In 1990, Ernie was awarded the General Division of the Order of Australia by Her Majesty the Queen.